For face products, this month I decided that I needed the Giorgio Armani Luminous Silk back in my life. I had finished my previous bottle and had never actually owned the shade for when my skin is fair. So with some thorough research (thank you Temptalia’s Foundation Matrix), I decided to order the shade 4.0 which is a perfect match. I have reviewed this foundation before (here) and it was actually my first ever blog post. This product is amazing – it can be worn as a light to medium coverage or built up to full, and it just makes my skin look flawless. In the same order, I also picked up the Urban Decay Naked Skin Weightless Complete Coverage Concealer (longest name ever) in the shade Light Warm, again through judging swatches online. This is particularly great for under the eyes – it has relatively high coverage but is so thin that it does not crease at all. I don’t think I love this on blemishes as it isn’t quite as full coverage as I would like. A rediscovery of mine this month was the Mac Mineralize Blush in Warm Soul. This is basically summer in a blush. It is a bronzey-peach with a lot of gold shimmer, that leaves my cheeks looking so glowy – I’m obsessed. It’s one of those shades that I feel goes with any makeup look I wear; consider it the summer version of Tarte Amazonian Clay Blush in Exposed. I have also rediscovered my love for another Mac product – their eyeshadows. I’ve picked up a few recently, either due to sales or gift vouchers, and it has really motivated me to start collecting again. My favourites have been Wedge and Trax – two new additions to my palette. Wedge is a great colour for everyday, for subtle definition in the crease or as a transition shade. Trax is a gorgeous mauve with a golden sheen, a great shade for those first dabbling in colourful eye looks. Another eye product I have been enjoying is the Soap and Glory Supercat Eyeliner. It has a felt tip so is easy to use, and stays put for a reasonably long time. Sadly I finished my Kat Von D Tattoo Liner in Trooper, and although I wouldn’t say the S&G option is quite as good, it is a decent alternative. 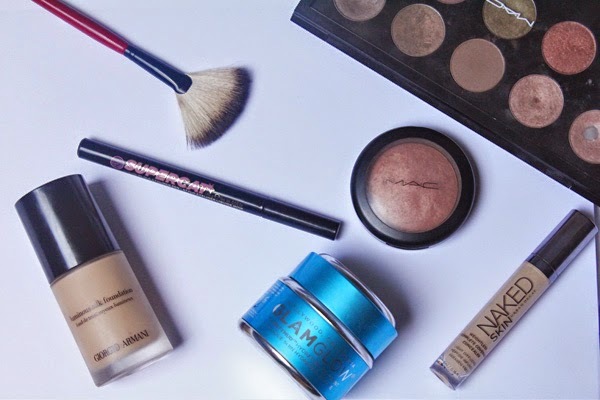 The next favourite is my latest purchase with my Boots points – I had some accumulated for a while now, and the Smashbox Fan Brush was on my wishlist, but I never saw it in stores or online. One day, when I was shopping in store, I saw it and knew I immediately had to buy it, and decided it was an apt purchase to redeem my points for. I love this brush for highlighting the tops of cheekbones and the bridge of my nose – it distributes enough product for the highlight to look incredible but not so much that you look like a frosty mess. My final favourite this month is the Glamglow Thirstymud Mask. My skin has really suffered from revision stress and tiredness, and putting this mask on overnight immediately makes my skin look 100 times better. It is a little pricey, but I have had it for ages and it isn’t running out too fast. Also the scent is gorgeous – it has hints of coconut that just scream summer. A short compilation of products, and unfortunately no lip products were involved. I feel I am far too fickle with lipstick to even attempt to name a favourite… What were some of your favourite products this month?